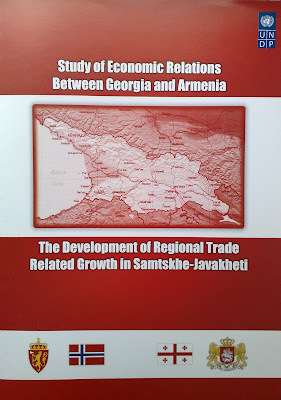 The research, funded by UNDP and carried out by CRRC, focuses on the challenges of cross-border economic cooperation development between Samtskhe Javakheti and Shirak. It addresses the following questions: why is so little trade taking place over the main Ninotsminda checkpoint? What legislative and procedural changes could make this trade easier? Particularly, in light of the large changes in physical infrastructure, legislation and development, in what areas are opportunities likely to open up for cooperation in the future? The report highlights some of the prospects for cross-border trade development which are embedded in the strong cultural connections between the two regions, seasonal differences and the quality of harvest. Thus, better customs procedures and transport infrastructure should create considerable opportunities for improvements in trade in the future. Recommendations concern both the physical condition of the checkpoints as well as the logistics. One of the main limitations of the research is its focus only on the Georgian side of the border. In order to identify the areas for the development of cross-border trade, clear understanding of the differences in the two markets is necessary. Thus, a similar study of the market in Shirak could make the results far more powerful.